No more sad "puppy dog eyes" to make you feel guilty for leaving your dog home alone all day. We provide a safe, happy and supervised doggy daycare environment where your dog is free to play off-leash with other dogs! Large breed and small breeds have separate inside and outside daycare areas. Doggy daycare is available Monday through Friday from 7:00 am to 6:30 pm and Saturday 7:00 am to 4:00 pm. 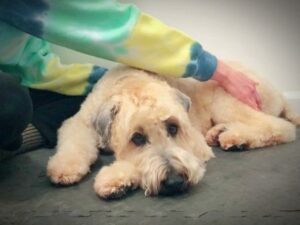 There is an application process to enroll your dog in the daycare, including a temperament evaluation. Not every dog is a daycare dog and because the safety and well-being of your dog is important to us we ask that you review the information on our requirements and policies tab to see if it will be a good fit for your dog. You are welcome to call or stop in if you have any questions. For the safety and well-being of your dog we limit the number of dogs in each daycare group. For that reason we require a minimum of 24-hour advance notice to get your dog on our daycare roster. As always, we will do our best to accommodate any client's special needs for a last-minute reservation. If you need to cancel, we require that you notify us by 8:00am the day of your reservation. During peak capacity periods* you will be required to pay for your daycare reservation if you fail to notify us. *Peak Capacity Periods includes, but is not limited to, major holidays, spring break and summer months. Nap time is a period of rest for your dog. He will go to crate and receive a small treat. You are encouraged to bring in a lunch or special treat that your dog enjoys. Care is taken for dogs with food allergies. *Please contact us to make arrangements if you are unable to pick up during our designated hours. Pickups after our designated hours may be subjected to a late pickup fee. Registration in our Client Portal is required to enroll in our daycare. Once you are enrolled and we receive proof that your dog(s) have met our health and vaccination requirements we will schedule an interview to meet your dog(s). During the interview we will discuss your application, answer all of your questions and perform a temperament evaluation. There is a one time non-refundable fee of $10.00 for the interview and temperament evaluation. Please be aware that the daycare environment is not suitable for every dog. The interview and temperament evaluation gives us the information about your dog's personality that we need to help them integrate safely into the daycare group. All dogs must be at least 12 weeks old. All dogs must be up-to-date on DHLPP, Bordetella and Rabies vaccinations. All dogs must be on flea, tick and heartworm prevention. Because we support the Geauga County Dog Warden, all dogs must be licensed within their respective county and wear their license tag. All dogs must be healthy enough to exercise. Owners will certify that their dog(s) is in good health and has not been ill with a communicable condition in the last 30 days. If your dog does become ill with a communicable condition, we require a veterinarian certificate of health to be readmitted. All dogs must be non-aggressive and not possessive of food or toys. Owners will certify that their dog has not harmed or shown aggression towards any person or other dog. Safety of all dogs will be our primary concern. All dogs must be brought to daycare on a leash and owners are responsible for picking up any solid waste in the parking lot or grounds of All About Dogs of Northeast Ohio, LLC if your dog eliminates before entering or after leaving the daycare. Enhance your dogs daycare experience! Holistic treat bag for each guest in your dog's session. Post on social media page. Special treat and toy for your dog.